While many foreign observers of China think that the country needs democracy, many Chinese citizens would be pleased if there was greater transparency [透明度]. In Nanjing at least, local residents are getting more evidence of the latter at work--construction work, to be precise. But the actual goal and role of this transparency are where matters get complicated. Nanjing’s ongoing water renewal project that began last year is one example of the government's strategy to be more open about local construction. Citizens were invited to leave comments; to contact site supervisors with questions or concerns; and to peruse various postings that carried information about the purpose and objectives of the construction. That approach is being replicated in at least one other major project—the widening of an important North-South Road in the eastern part of the city. On the one hand, the purpose of this transparency seems to be clear. By telling residents the tasks and the timeline of the project, local officials believe that property owners and renters will see the inconvenience as merely temporary; that specific concerns (such as noise or dust) will be raised with the appropriate company representative on-site for response; and that rumors won’t take root. This isn’t about maintaining social stability by stopping protests but attending to local society through better governance. It's more than a little impressive. Transparency also works to hold the construction company doing the work accountable. 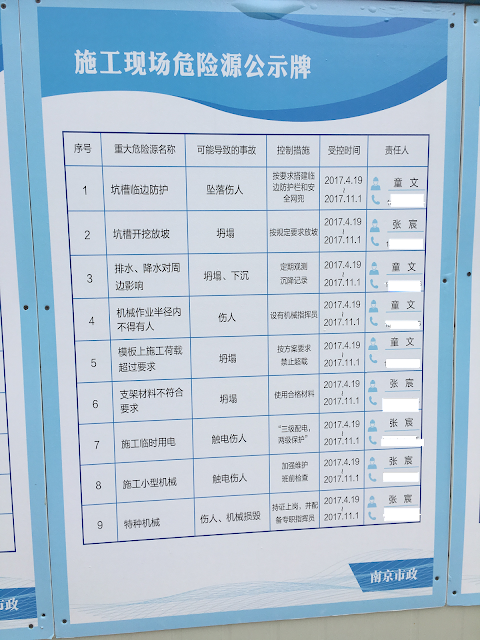 Instead of residents complaining to the local government and expecting official intervention, minor problems that can be resolved at the project site by contacting the people at the listed phone numbers. That approach improves efficiency, lessens the need for administrative oversight, and casts officials as problem-solvers instead of problem-creators. It also ensures that local construction firms stay on the right road themselves—that is, they don’t take the awarding of contracts for granted, and treat projects not as prizes but assignments to be completed. But there’s a larger aim at work here which isn’t so—well, transparent. Local governments in China—Nanjing and others in Jiangsu included—are known for favoring construction firms with close ties to powerful developers. Those developers often have connections with officials. That’s certainly been the case with housing projects in recent years, and now that local infrastructure projects are receiving more funding by governments interested in attracting and retaining the right kind of residents, there’s concern in some circles that the same outfits will benefit. That’s to say, the corruption that’s here won’t be going away unless something’s done about it. So while Beijing hunts “tigers” there and abroad, Nanjing is after local game. 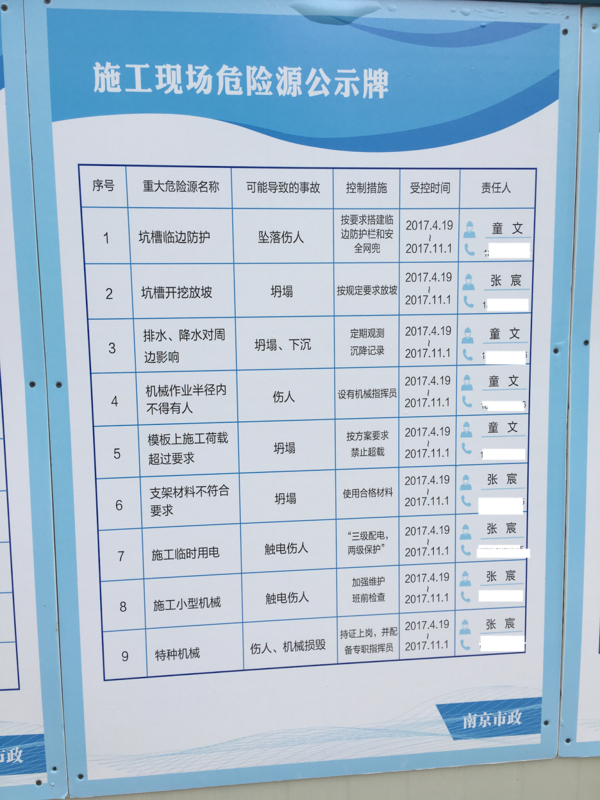 To address corruption in the construction industry, Nanjing government has “started special action” [整治专项行动序幕] to “tightly grasp the outstanding problems in the realm of construction engineering projects” [紧紧抓住工程建设领域的突出问题] and “combat all kinds of illegal acts” [打击各类违法行为]. In other words, at the same time that authorities here are holding construction firms to account by increasing public supervision, they’re also launching a local rectification campaign, sending inspection teams into offices and job sites, looking into bidding processes, and how materials and equipment are purchased. Is this a coordinated policy with the aim of reining in firms whose conduct will no longer be tolerated? That’s likely, because the announcement of the campaign also mentioned “enlarging the role of guided public opinion” [加大舆论引导力度] and “striving to create a good atmosphere for the masses to support and participate” [努力在社会营造群众支持参与]. That may seem to be boilerplate language about “the masses”, but in this context, it’s significant because it indicates recognition in official circles that top-down regulation isn’t sufficient to fight local corruption. Residents will provide pressure from below to help oversee implementation of construction projects, while officials will supervise from above. At the same time, there’s just not enough interest in official circles in letting the public play a more direct role in fighting graft. Commenting on policy shortcomings is clearly welcomed, even encouraged in Nanjing, though residents are expected to provide general approval and to dissent only on the details. Allowing residents to express specific discontent while seeking to steer public sentiment towards approved targets reminds all that China remains a State-directed society. Transparency of the sort being practiced in Nanjing these days may seem to some as a door to democracy, but it’s far more likely to remain merely a window. I agree that it is far more likely to remain merely a window. The feeling I get through my own research is that most Chinese tend to have the attitude of 多一事不如少一事. Unless it directly impacts on their own self interest, otherwise most would not be willing to report graft or other forms of wrongdoings. There is this fear of blowback (either fearing that the authorities are also in on it or stepping on some powerful person's toes who might make their lives difficult). Thanks as ever for your thoughts. I agree, and think that the social roots of behaviour are crucial. The template or model that's projected upon China from afar rarely adheres here. One sees dissension but it's always local; there's also anger and confrontation when something affects one's property or assets, as you note. But community-based sentiment is largely absent, with the odd exception when someone or some firm crosses a line that they failed to see, and which is difficult to discern for many.